We used this rug outdoors we have had no problems with wear and tear at all. It vacuums up very well. Color is as shown. Would definitely buy again. Create a soothing sanctuary with this organic border design rug from Safavieh's Natural Fiber Collection. Crafted from sisal, this cleanly woven, durable, and innately soft rug will add warmth to any home decor. 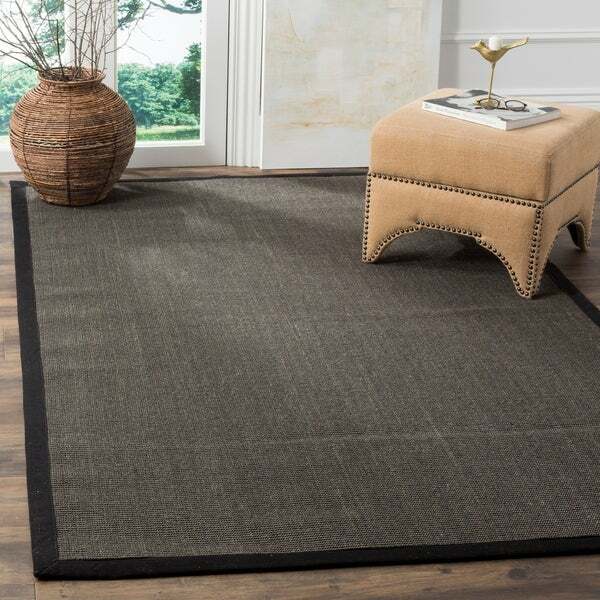 The natural latex backing prevents unsightly wrinkling or bunching, and the charcoal fringeless cotton border provides a clean-cut visual aesthetic. This rug is an ideal choice for those looking to add a homey and casual motif to their living space. Its casual nautical vibe is evocative of a coastal living environment, yet its limitless versatility allows it to assimilate effortlessly into an urban setting. If used as an entrance area rug, it provides protection in a high-traffic space. In other rooms, its clean, neutral pigments will blend with new and existing decor seamlessly. If you're looking for a charcoal-colored rug, this isn't exactly it though it's a very acceptable alternative. It just has less of the bluish tinge you'd expect of charcoal and is more of a faded or "organic" black. Still, the quality of the construction is good. The Overstock price is still a bit high for this kind of rug though, considering that I once bought a handwoven wool kilim from the Middle East (directly from there I mean) for the same price. I would not vacuum the cloth edges of this rug (except with a hand-held vacuum perhaps) for fear of the stitching coming off. We have put the rug under our dining table and since there are two other rugs in the living area that are patterned and not too far away (including the afore-mentioned kilim), a solid color works well. It will show crumbs, I'm sure, but that's not a bad thing -- at least now I'll be able to see where I dropped food and be able to pick it up! My house doesn't have the luxury of a small room to take off your coat and shoes, but rather once you're through the front door, you're in the kitchen! It has taken some getting used to, especially when it's snowing, raining and especially windy. 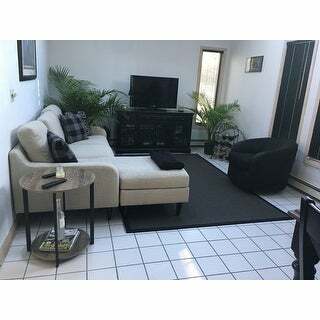 BUT having this rug right at the door and also continuing into part of the living room makes it feel cleaner and looks like it belongs there. 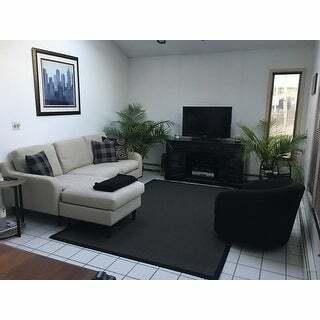 The dark gray color has a modern feel to it, which goes with my mid-century style interior. I just recently purchased another exact rug for the remainder of the living room floor and now there is a continuity to the room. The texture is a little rough on bare feet, but I always wear slippers around the house. The best part of these rugs is that for us it helps keep the dog hair at bay, so there is less of it flying around. I may get one more for one of my other rooms with a side door - which is more of a thoroughfare. This rug will look great anywhere.. and with just about any decor... in my opinion. The rug looks great. The color is beautiful. A dark grey with a black border. Love it. Great casual area interior rug. May 2016, Follow up on this rug I bought in 2013, it is wearing well, hardly any signs of wear and I have to indoor dogs and two sons plus my husband and this is in the family room. I am very pleased with the way it is wearing, how it functions and how it looks. 2013- I will be interested in how this wears but it looks great and was exactly what I was thinking of for this casual area. The only thing I would say is it is much thinner than I thought it would be. It lays flat immediately without any curled ends which pleased me. I have a very flat skid-free pad that is intended to be used when putting a rug on carpet, I like it because again it is very thin as well while still providing the no-skid duty. I was looking for a rug for our exercise room to go on wood floor. I liked that this rug was natural fibers, but was concerned about softness. This line is in the specs: This casual rug is "hand-woven with natural sisal fibers that make it innately soft" In my opinion this rug is in no way "soft" The fibers feel very prickly on my feet. Very bummed! Now I'm back to looking for a rug AND have to pay for shipping to return it. I was looking for a sophisticated jute rug in a dark gray/charcoal color (which is hard to find! ).Some reviewers complained about the dark color of this Serenity jute rug, so I thought 'that's my rug'! I am more then pleased with the product since it is of excellent quality and looks chic in the dining room of our contemporary house. Most remarkable: The rug was very well packed, carefully rolled on a cardboard roll and thus had no wrinkles!! Very pleased with the rugs (bought the 30x48 also). Great color and fits in with colors surrounding! Very well made and has nonskid back! I was skeptical because I'd never seen a dark charcoal sisal rug with black border and was afraid the colors would be "off", dull, or muted but they were just like the photo. The charcoal is a very deep grey and the black trim is a true black and not washed out looking. The rug itself is well made and a very good heavy quality. It looks fantastic in our newly redone living room. This is a great buy, urban chic, yet earthy at the same time! Perfect size and color for area. Keep in mind the natural fiber is not soft to touch! The color was exactly as pictured. The border on the rug is well stitched and the rug for our needs is perfect! I bought this in December for living room and already shows signs of wear. Also difficult to clean well with vacuum. Too expensive for shipping cost to return. Love this rug as much in person as I did from the photo! Purchased for our kitchen under our table....really pops on our light tile floors and looks great with our black farmhouse table and benches. Very durable for this high traffic area and easy to clean. It is not soft on the feet but does not matter in the kitchen. We did not purchase anything to hold it in place and it does not slide at all. No problems or tears from the great dane and golden doodle that love to sit by as we eat! This rug arrived quickly and looks very nice in person. The rug is pretty thin so it feels better with a cushion underneath but the color is nice and dark. Great rug. Not soft on bare feet. But holds up great. I recommend this rug. It didn't require any time to lay flat. The weaving is even, so it gives a crisp color contrast. The charcoal color is on the warm side not cool or blueish. Don't put it in an area where you want to go barefoot, though - it's quite rough. Rough on the bare feet, but great for entrances. exactly as pictured - a little rough but great for a dining room. Nice rug. Definitely rough, but that’s expected. "The rug says it is 6x9, but what are the actual dimensions?" "Is this carpet soft enough to walk on with bare feet?" No, I did not find this carpet soft at all. I purchased this for my son's room but ended up using it in our sun room. I chose it based on the reviews and the color. "Is this rug stiff enough that when I put it on top of the wall to wall carpet in my house it wont get rolled up easily?" Thank you for your question. This rug is very durable and pretty stuff, but we would still recommend the use of a non-skid pad to hold it in place on your carpet. "Can you Scotch Guard this rug?" There are products for this purpose.